As a tour or activity business who’s just set up their website online, your number one job is to get your site found by your target audience. After all, does it really matter how great the content on your site is if no one’s going to see it in the first place? The key term here is to ‘get found’, meaning you want them to come to you, instead of shouting at a bought list. But how does Google decide that something is relevant to your site? Besides technical on-page SEO, off-page SEO is probably the most valuable way of improving your search ranking. By off-page, we mean links that are going into your site, from outside your site. The more credible and relevant sites you have linking to you, the easier it will be for you to increase your search engine ranking. #1 Create content, and share it! 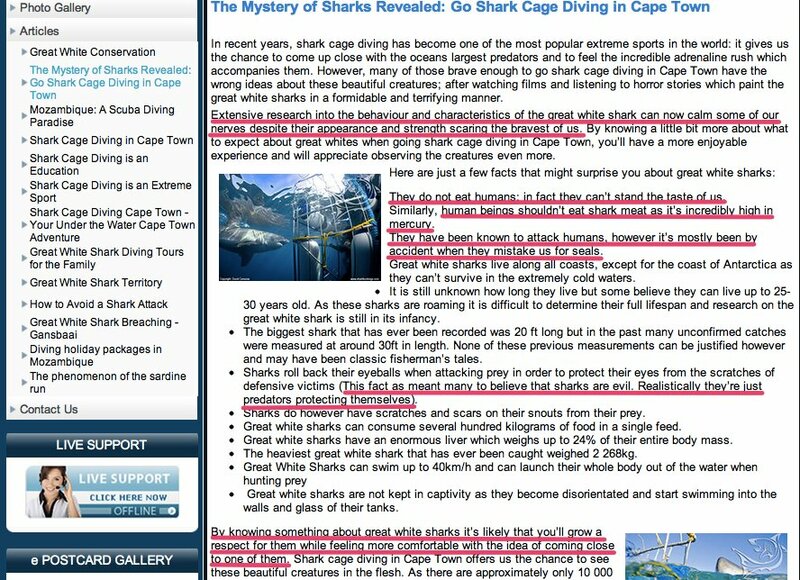 They were clever to create content that addresses the fear of sharks that probably causes prospects to hesitate. When you write blogs for other people, they usually let you put a link back to your site in the author’s section. This link counts as a weighty link in Google’s eyes – and odds are, they probably have their own ways of promoting it, increasing your presence online. Try to think of the most relevant sites that you can blog on – those that post topics you’re knowledgeable enough to discuss. This is an absolute must, especially Google Maps! Others to submit to are Bing and Yahoo, although those aren’t used nearly as often. In Australia, there are plenty of Australian business directories online. Links from these places are just further validation that your site is a legitimate business, increasing your website’s authority. Establish your corporate identity through social media networks! Google uses social signals in their code to determine rank, so Google+ is definitely a must. Other relevant social networks for tour and activity operators include LinkedIn, Facebook, Twitter, and even Pinterest! Besides being a way of showing Google that you matter, it’s a great way to interact with your prospective and current customers. Are there any similar companies that you can share links and content with? What about client and vendor sites? While you can flat-out ask clients for links, try telling vendors that you’ll give them a testimonial that they can put up on their site in exchange for one linking back to your site. While you read up on industry tips and news, leave a comment with a link back to a relevant page on your site. Make sure your comment is adding to the discussion, because community members will let you know if it doesn’t – and they might not be very nice about it. There’s a fine line between adding value to a discussion and being spammy. Write original articles with a link pointing back to your site, and submit them to ezinearticles.com or suite101.com. Though Google is targeting these kinds of sites by devaluing their link worth, article submissions will still give you inbound links and since you’re using original content, it should still be considered for your strategy. Try giving away free products to travel bloggers in exchange for a review. Make sure that you choose a blogger with good site traffic – you want their review to be read, lest your free product go to waste. This isn’t easy though, you will probably have to spend some time conducting research, writing emails, and calling up potential link helpers. The main task of getting found is to rank somewhere on Google. Though it takes lots of time and effort to achieve, making sure your site is optimised for search engines will give you a steady flow of traffic – and not just any old traffic, but quality traffic – because these people are searching for words that Google sees as relevant to your site. Do you have any SEO techniques you’d like to share?